In previous blogs, I have already spoken about my CD collection, how I’m proud of it and how it has grown over the years. However, today I want to delve a bit further and discuss why it is that I am obsessed with CDs to the extent that I am. Firstly, it must be said that, having been born in the early 80s and then not getting into music properly until the early 90s, I missed out on the original vinyl days. I have a few records but am currently without a turntable on which to play them. I will concede that, as a work of art and as a ‘thing’ an LP is very hard to beat. However, it was a dying medium when I began my musical quest. I also never got into the cassette tape. Again I have a few but even as an 11-year-old, I could not understand the logic of spending £10 on something that would eventually wear out, particularly if it was subjected to lots of fast-forwarding and rewinding. From an early stage I thought it would be far more sensible to buy something that, if looked after, could possibly last a lifetime. Enter the Compact Disc. For me, the CD had everything – longevity, great sound quality and a decent size for the purposes of artwork and lyrics. OK, it was never going to be as good as an LP for artwork purposes, but it was perfectly adequate for those of us who had decent eyesight! I will admit that compact discs have their flaws; they are prone to scratching if not treated with due reverence and the standard plastic ‘jewel cases’ can be extremely flimsy. I have lost count of the amount of times I have bought an album only to find that the teeth that hold the disc in place are broken or the plastic hinges have snapped. Sometimes, the front of the case will crack and even more annoying are the little ridges that hold the booklet in place – they always seem to make it impossible to remove the booklet without scuffing or bending the edges. It drives me mad, I can tell you. And yet, for all that, some 2000+ CDs later, I still love the things and I still get that tingle when I’m handed a present for my birthday or at Christmas which is quite obviously the shape and size of a CD. Who ever said that obsessions were rational eh?! I quickly discovered that one way to avoid the issues with jewel cases, was to avoid them and, wherever possible, opt for the cardboard ‘digipack’. Most of the time, these would be the ‘limited edition’ version and could cost a little more. Quite often, they’d feature bonus material too. However, they were not without their flaws too, as they could scuff or bend very easily; if a spine was bent, I would not be very happy at all! I would then opt, where possible, for the even higher end of the market and buy the album in a digibook or media book format should it exist. Often made of a higher and stronger grade of card with a more durable shiny plastic cover, these quickly became a favourite of mine. These versions would generally be even more expensive, again limited in numbers, but I have lost count of the numbers of these that I now have. As you can imagine, things began to get a little out of control and I would begin to opt for the most limited edition of the album that I could find. This was less and less about the need to avoid jewel cases and would be more about the rarity value. Now, if there is a limited edition version of an album, it has to be the one I go for. I am not interested in having the standard version, I want all the bells and whistles! In the world of heavy metal, fans are very lucky because both the bands and the record labels understand the importance of a good product. In the more mainstream world, this is less the case. Therefore, if you are willing to spend a little more money, the product can be spectacular. 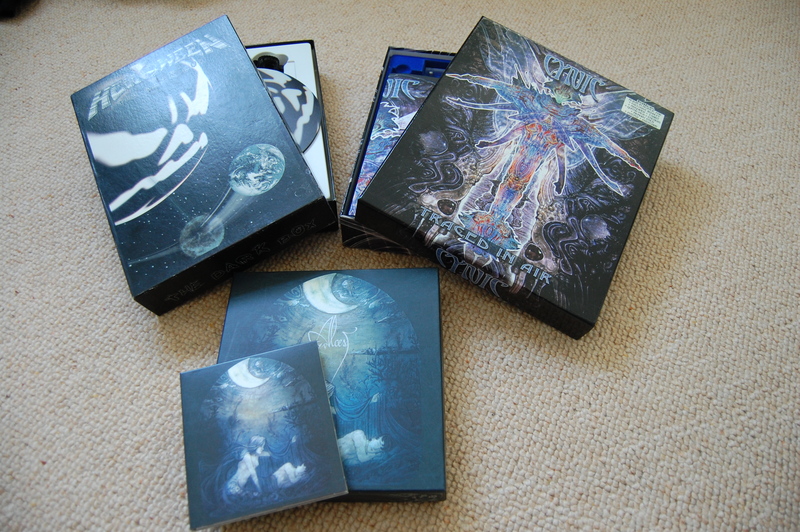 Naturally I was interested if the limited version came with bonus audio or visual content but my biggest concern was the packaging and the rarity of it – the less that were made, the better as far as I was concerned. In fact, that is still the case! 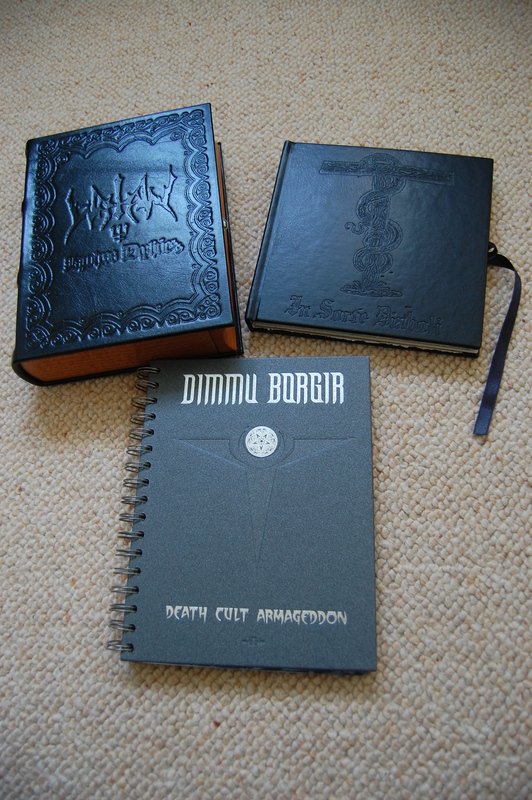 As a result, I can boast some really wonderful additions to my collection. 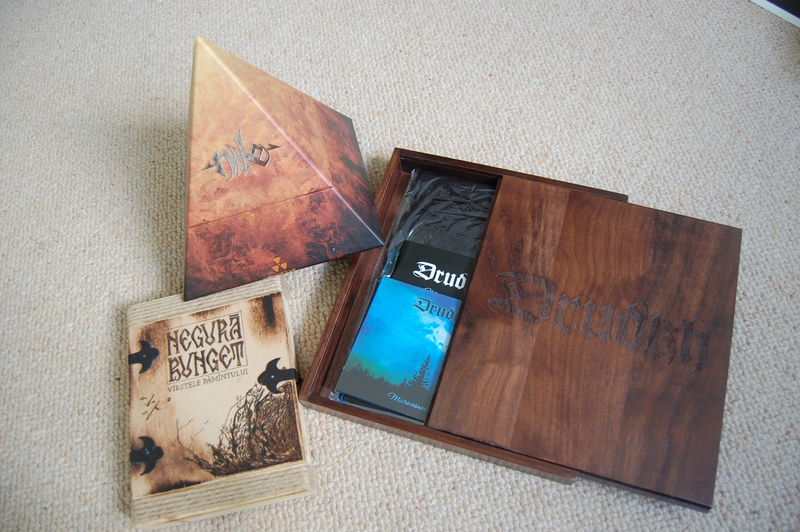 The Nile CD packaged in a pyramid, the handcrafted wooden boxes courtesy of Negura Bunget and Drudkh and the leather-bound Dimmu Borgir and Watain affairs. 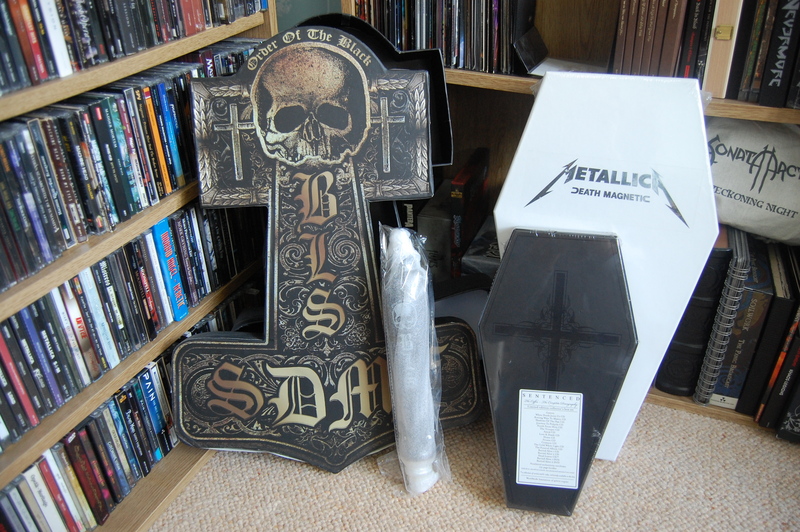 Then there are the coffin-shaped Metallica and Sentenced packages as well as giant boxsets from the likes of Helloween, Cynic and Alcest. 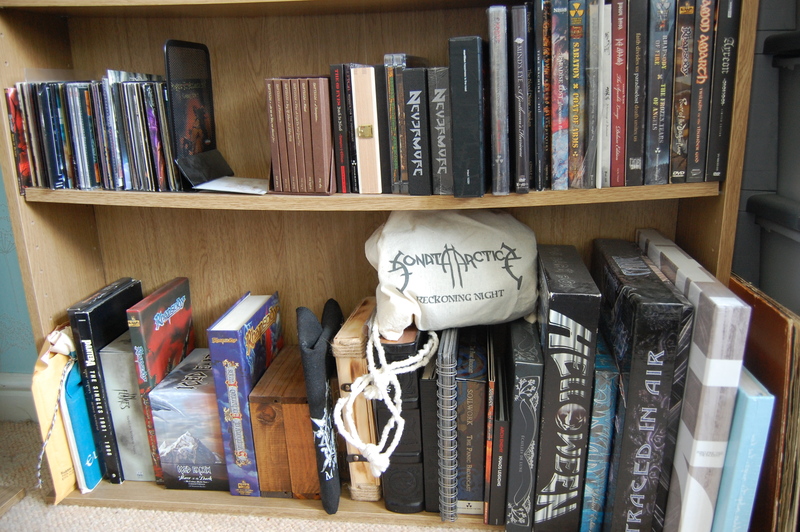 Not to mention the In Flames pinball box, the metal and parchment Dimmu Borgir ‘book’ or the Black Label Society boxset complete with a beer pump handle! I even went through a stage where I was obsessed with promos! I think that this is all part of the reason why I love CDs so much and why now, when there are so many easier ways to get music instantaneously in the digital format that I will always choose to buy the disc. With a digital download, can you pull the cellophane off the packaging, careful to ensure you keep the ‘limited edition’ sticker intact to reapply or keep with the item? Can you open the packaging and see the disc twinkling back at you, adorned with lovingly-applied artwork? Can you gently remove the booklet and smell that unmistakeable just-printed smell? Can you insert the digital music file into your stereo and listen to it as the artist intended? While you’re playing the digital sound file, can you sit in your favourite chair, lean back and lovingly pore through the booklet? Can you lose yourself in the lyrics or read the liner notes and thank you sections, so see who gave this band their help and inspiration this time around? I may be sticking my neck out hugely here, but I think the answer may be ‘no’ to just about every one of these questions. Yes, OK, you can print out the artwork with some digital downloads, but this is not the same. Not even close. Even if you’re desperate to listen to the music on your mp3 player or flashy phone, just rip it onto your device from the CD, it’s not that difficult – even I can do that as and when required. You may call me old fashioned, out-of-touch, a dinosaur or even a luddite. But I don’t care. Digital downloads are useful occasionally, but they will never steal my heart like CDs have or, if you’re a vinyl fan, like an LP can. It’s one of life’s impossibilities I’m afraid and that’s why I will buy the CD until the day I die…or until CDs themselves die out. It’s a thought that I don’t wish to ever have to contemplate. For me it simply became an issue of space. We don’t have any. Since about 2004 my CD’s have been relegated to the spare room wardrobe and I’ve bought everything digitally. In fact, criminally, sometimes I can’t even be bothered to go and find one that I haven’t loaded onto iTunes already and have been known to buy it again digitally because it’s easier. But then nowadays isn’t everything about ease and speed? I kept burning albums to disc for a while for the car, but as my last 2 cars have had iPod connectors there’s not even a need for that now. I totally agree it’s not the same, nowhere near the same – one of the biggest things I’ve noticed is that I barely know the names of songs any more or what track they are on an album because once you hit ‘play’ on iTunes (other media players are obviously available…..) you don’t look at it again because there’s nothing to look at. Sad side effect I think. Being older than you Matt, I do remember vinyl, but only for a few years – my teenage record buying was initially all vinyl or cassette. I used to particularly love gatefold sleeves on albums and would spend hours going through the inner sleeves and inlays, even reading all the thank yous from the bands etc. Also coloured vinyl – that was always exciting when you bought a 7″ single and it was something a bit fancy. One of my faves is a picture disc of Fog on the Tyne. Just imagine Gazza’s gurning mug going round and round on the turntable…(I bought it to be ‘ironic’ – pretentious student alert). I too have moved my cd collection up into the attick room , it keeps my vinal collection company ! i never did get to grips with cds , they were just too small , could’nt read the notes , they were wana be LPs , a sort of a make do & mend , but i , like Kirst , suffer the fatal , oh what is this song called , or even what album or who is this , the ipod is the devils work , its even smaller , cant read the screen , it has a mind of its own , turns itself off , plays the same songs over & over , & then freezes for no reason what so ever , but carrying thousands of tracks around & being able to play one at the drop of a hat is the plus . & for that reason , it has won my heart .